In the last 15 years, Child’s Play has partnered with over 160 Children’s Hospitals and over 100 Domestic Violence Shelters to improve the lives of children through the kindness and generosity of the video game community and the power of play. In the last year, we have funded five more Gaming and Technology Specialists across the country, as well as funded another 30 grants to update equipment and bring new technology like VR bedside. Join us for an elegant night to celebrate the giving of the gaming community. 100% of the money raised at the Child’s Play Dinner Auction goes to support our hospital and domestic violence shelter programs. You can purchase your individual tickets here or if you or your company is interested in sponsoring a table you can find more about how to do that here. If you have any questions about auction item submission, please feel free to contact us at info@childsplaycharity.org. In the last 14 years, Child’s Play has raised over $44 million dollars to improve the lives of children in pediatric hospitals and other child welfare facilities through the kindness and generosity of the video game community and the power of play. In the last year, we have added 13 new partner hospitals and awarded over 40 grants to facilities. Join us for an elegant night to celebrate the giving of the gaming community. 100% of the money raised at the Child’s Play Dinner Auction goes to support our hospital and domestic violence shelter programs. If you have any questions about auction item submission, please feel free to contact Travis Eriksen: teriksen@childsplaycharity.org. Since 2004 the Child’s Play Dinner Auction has given the supporters of Child’s Play an excuse to don their finest and spend an evening together. Each year, in early December, hundreds of people from the gaming and tech community gather to raise money and celebrate another successful year of Child’s Play. The evening begins with a silent auction and appetizers. 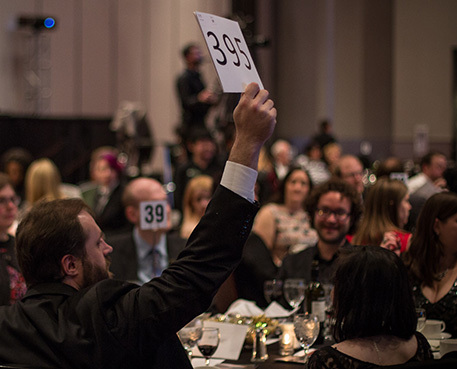 During the silent auction, guests have the opportunity to mingle with friends, meet new people, and maybe even rub elbows with famous internet and industry celebrities. The items in the silent auction vary from lovingly handcrafted quilts to unique pieces of art donated by talented community members. The auction also includes one-of-a-kind items donated by companies from the comic and gaming industry such as signed game boxes and statues. When the silent auction closes, guests are invited to find their table for dinner and the live auction. This year guests will enjoy Boneless Cabernet-Braised Short Rib, Seared Sage Chicken or Butternut Squash Ravioli while enjoying the live auction hosted by Mike Krahulik and Jerry Holkins, Gabe and Tycho, of Penny Arcade. The live auction brings the most highly anticipated items of the night, which, in the past, have included a chance to play Dungeons & Dragons with Scott Kurtz and Chris Perkins, Dungeon Master for Acquisitions, Inc., A Thornwatch Afternoon with Penny Arcade and Lone Shark, or a 20th Anniversary Edition PlayStation 4 (one of only 12,300). All of the money raised at the Child’s Play Dinner Auction goes to support our hospital and domestic violence shelter programs. Through Child’s Play, the gaming community has raised over $40 million dollars to help children around the world through the power of play. This year, the Child’s Play Dinner Auction will be held December 8th, 2016. We look forward to another wonderful evening and hope you will join us. You can purchase your individual tickets here or if you or your company is interested in sponsoring a table you can find more about how to do that here. If you have any questions about auction item submission, please feel free to contact Erick Blandin: eblandin@childsplaycharity.org. If you have other questions about the auction, contact Travis Eriksen: teriksen@childsplaycharity.org.